IN SUZANNE Loudamy's house, the word "like" is under siege. When her 18-year-old daughter, Sarah, speaks, Ms. Loudamy holds up her hands to count how often the word leaves her mouth. "My mom talks about how it's not, like, professional and says I'll look stupid," says Sarah Loudamy. "But someday everybody my age will be in the professional world with me. If they're saying 'like' too, I won't stand out." Two decades after the song "Valley Girl" popularized it, a fresh effort is afoot to stamp out this linguistic quirk. The generation that grew up saying "like" is hitting adulthood and the work force. As a result, it is now in the lexicon of investment bankers, doctors and even teachers, where it can sound especially jarring. "I'm sure I say, 'like' a lot," says Liza Sutherland, 28, a sixth-grade humanities teacher in New York. "I don't worry so much about how my students speak." Like a verbal virus, this usage is also increasingly spreading to other English-speaking countries. British and Canadian kids now grease their sentences with the word. Sali Tagliamonte, professor of linguistics at the University of Toronto who has researched the speech of the elderly in the United Kingdom, found that they, too, have a surprising fondness for "like." "If I showed you a written document of the conversation, you would think they were young women in North America, not 78-year-old ladies from Scotland," she says. mimic their kids and "like" them right back. Fed-up English teachers are turning their classrooms into "like"-free zones. Even speech pathologists are being called in to help break the habit, at rates of as much as $100 an hour. One common tactic: tape recording or videotaping the afflicted as a kind of shock therapy to show them how "like"-infused they really are. In one exercise at Leap Learning Systems, a language school in Chicago that offers after-school and summer programs to help inner-city kids master "standard business English," students are asked to shout "beep beep" whenever a speaker in the class uses "like," among other words, unnecessarily. Katie Schwartz, a speech pathologist in Chattanooga, Tenn., has a more Pavlovian technique. Her "Sense Cues" kit trains speakers to associate the smell of something they don't like with remembering to delete superfluous "likes" from their conversation. When the "likes" start spilling from the mouths of Vickie Bunting's students, she writes their sentences on the blackboard and has them read the words back. "It will click and they'll see it doesn't mean anything," says Ms. Bunting, who teaches high-school English in Lubbock, Texas. Language watchers offer various theories to explain the spread of "like." Some blame declining emphasis on grammar instruction in schools. Others point to an explosion of slang in music and movies, making nontraditional speech more widespread and acceptable. Defenders of the practice argue that these usages are just a natural evolution of the English language. Indeed, even some linguists say the word can be downright useful. When dropped into the middle of a sentence, for example, it gives the speaker time to gather his thoughts so he doesn't say the first (sometimes insipid) thing that comes to mind. Studies also show that people who have learned not to use filler words are interrupted more often, and tend to use simpler sentences. "It really is a wonderful, useful word," says Muffy E.A.Siegel, an associate professor of English at Temple University in Philadelphia, who has studied the use of "like." 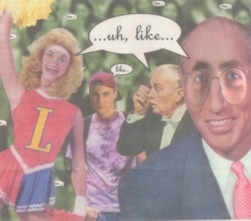 Valley Girls weren't the first group to find some other uses for "like." Jazz musicians and beat poets used it as a filler word in the 1950s — as a substitute for 'um' — according to linguists. In the late '70s in Southern California, the word for the first time started turning up, in popular form, to introduce a thought or bit of speech. Like 'really is a wonderful, useful word,' says one professor of English. youth culture with the song "Valley Girl" by Frank Zappa and his then-13-year-old daughter Moon Unit. A decade later, "like" with a form of the verb "to be" was voted the phrase "most likely to succeed" by the American Dialect Society, a group that studies American English. And succeed it has, judging by the frequency with which it still pops up in conversations. In a University of Alberta study, which involved 30 Americans ranging in age from 14 to 69, a couple of the participants used the word more than 100 times in a half-hour conversation. The study found that, while younger people used it more often, all age groups employed the Valley-girl-type "like." Indeed, while the stereotypical offender may be a 15-year-old suburban girl who twirls her hair and works at the mall, some studies show that boys are now just as likely to abuse the word. Some of the "like"-dependent just end up reaching a compromise of sorts. Justin Slay, a 15-year-old in Lubbock, Texas, says whether or not he uses it depends on whom he is with. "Girls say it in almost every sentence," Justin says. "I don't say it when I'm talking to guys."